The National Security Council (MGK) released a statement late Wednesday reiterating its call for an end to foreign aid to terror groups targeting Turkey. 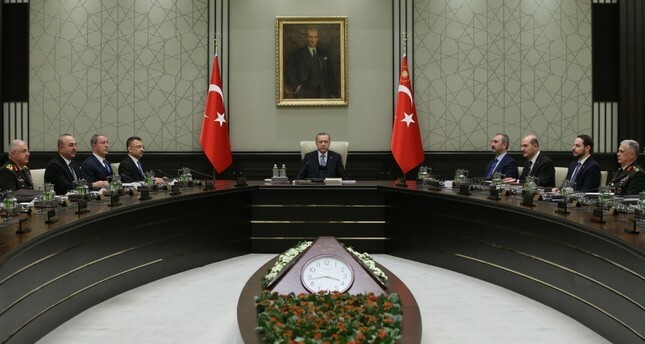 In a statement after a five-hour meeting in the capital Ankara, MGK said that Turkey will maintain its stance on preserving current status in Syria's Idlib, implementation of Manbij roadmap and deals east of the Euphrates River. Last week, President Recep Tayyip Erdoğan said Turkey was ready to take over the security in Syria's Manbij without delay during a phone conversation with his U.S. counterpart Donald Trump. A statement from the Turkish presidency said Erdoğan and Trump agreed to take joint measures to clear Daesh's remnants in Syria and prevent the group's resurgence. The council emphasized on securing country's southern borders as part of counter-terrorism efforts. Manbij and surrounding areas have been under the control of U.S.-backed Syrian Democratic Forces (SDF), which is dominated by the YPG, since August 2016 after it ousted Daesh, who had captured the town from moderate oppositions in January 2014. Turkey, however, strongly opposes YPG presence in Manbij. It has been a major sticking point in the strained relations between Turkey and the U.S., due to the latter's support for the YPG under the pretext of fighting Daesh. The YPG has organic organizational and operational links with the PKK, which is considered a terrorist organization by the U.S., the EU and Turkey. The council also stressed measures against terrorist organizations that are disturbing the country's peace. The council said it is "unacceptable" that some countries are refraining from extraditing terror group members. Earlier in January, Justice Minister Abdulhamit Gül said that Turkey will take all legal actions for the extradition of Gülenist Terror Group (FETÖ) leader Fetullah Gülen from the U.S.
FETÖ and its leader Gülen orchestrated the defeated coup of July 15, 2016, in Turkey, which left 251 people martyred and nearly 2,200 injured. Ankara also accuses FETÖ of being behind a long-running campaign to overthrow the state through the infiltration of Turkish institutions, including the military, police and the judiciary. Wednesday's statement also said Turkey will watch closely the developments in Cyprus, the Western Mediterranean, Aegean and Black Sea, taking action to protect its rights as given through international agreements.